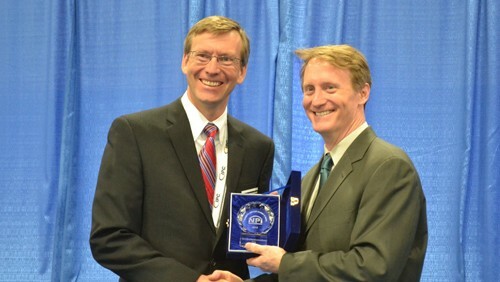 Indium Corporation Executive Vice President Ross Berntson accepts CIRCUITS ASSEMBLY’s NPI Award from Mike Buetow, editor in chief at CIRCUITS ASSEMBLY. Indium Corporation was presented with CIRCUITS ASSEMBLY's NPI Award for its LV1000 flux coating for solder preforms at the IPC APEX Expo on Feb. 24 in San Diego, Calif. Sponsored by CIRCUITS ASSEMBLY, the NPI Awards program recognizes the electronics assembly industry's leading new products. Awards are selected by an independent panel of practicing industry engineers. LV1000 is a series of flux coatings that offers low voiding, especially in situations where the component footprint will not allow for proper outgassing of volatized flux. Its glossy, even coating is durable, so it can be used in automated assembly processes. LV1000 is halide-free, meeting ROL0 requirements, and passes Telcordia GR-78 testing in the unactivated state. The coating's tolerances are well-controlled, down to 0.5% by weight, to ensure no additional flux is required. LV1000 is versatile, allowing for the coating of unique geometries and sizes. LV1000 is not only a formulation, but a process which produces flux-coated solder preforms that meet the tightest of flatness tolerances, ensuring that electronic components solder correctly, thereby minimizing defects. For more information about LV1000, visit www.indium.com/LV1000. For more information on flux-coated solder preforms, visit www.indium.com/flux-and-epoxy/flux-coated-preforms.